Cory and I went to the beach Tuesday. Beth declared that she wasn't going and she never wants to swim again - so she stayed home. It really irritated me - here I was taking time out of my life to do something fun with my kids, and she didn't even appreciate that. By the time Cory and I got to the beach, I realized this could be a good thing. So I called Beth and told her that since she was home and I wasn't, she got to make dinner. Amazingly, she didn't even complain!? So, after a fun afternoon at the beach, Cory and I arrived home, about the same time as Jeffrey did, to find Beth working on dinner. 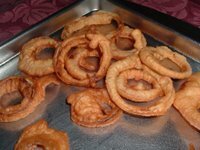 She had made onion rings - burning herself a little and melting a plastic plate in the process, but she's ok. And she was browning the hamburger with onions and garlic to make tacos. After Cory got out of the shower, he helped her finish up by grating cheese and other details. It was all really good. I knew she could handle it! But I still want her to come to the beach and play with me. Does she look like anybody? People are always coming up to Beth and telling her that she looks like Julia Roberts - but she could never see it. I'm not entirely sure I could ever see it either. We've never gotten the two of them side by side, after all. Cory took this picture the other day, and Beth thought she could see the resemblance for the first time. I'm looking at it trying to see - but she just looks like my Beth. I posted the picture on Flickr to see if anyone might see it and guess who I was referring to when I asked "Does she look like anybody?" Cory jumped right in and said Julia Roberts - but I deleted the comment because that just defeated the purpose. So far no other comments. I just uploaded pictures of Jeffrey's summer project to my Bolt account. Though I'm not particularly impressed with Bolt, they do offer plenty of FREE storage for photos, videos and such - and this slideshow is cool.